Warning: Planning to do MBA? 7 out of 10 students go jobless even after getting degree! Home > Blog > Blog > Warning: Planning to do MBA? 7 out of 10 students go jobless even after getting degree! Even after spending lacs on a business education, majority of Indians are struggling to find work or report salary drops and even some find their degrees to be hardly valuable. Why MBA graduates in India are struggling to get even a basic job that could help them earn a living at least when once upon a time doing an MBA to secure a career used to be as important as getting a passport to stay safe in a foreign country. So, let’s go ahead and find out as to why 7 out of 10 students in India go jobless even after getting a degree. However, before that let’s have a sneak peek to a few stats related with performances of the B-Schools and the ‘MBA degree’. MBA used to be a very good option to secure a career till last few years, but now things have changed and that a simple MBA can secure you neither a career nor even a job to earn a living. 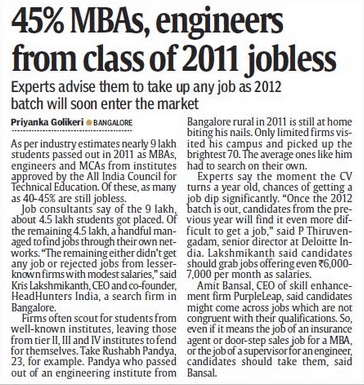 People are doing MBA just for getting a degree and perhaps a job that too they don’t get and are going jobless. • They teach a lot on theories of business and marketing but when it comes to the actual practical knowledge, the one that you need to run a business and carry out marketing campaigns, they goof up. As until and unless you have your hands on it, you can’t get to face the real world issues and so you can’t deal with them either. Companies need professionals who can help them in developing their business, increase their leads, sales and profits and looking at the current marketing scenario you can’t accomplish that with the old style of all so ‘theoretical’ kind of education. Even the books that they distribute among students or say the study material has not changed at all for almost last two decades. So, of course B-school students become very good presenters but end up losing scores when it comes to playing a role as an efficient manager or an efficient marketer. The B-School need to identify with the need of the hour and realize that the old school education can’t bring business and that to tap into the platforms where your customers are you need to upgrade. Otherwise, customers will move on leaving you and your business far behind! The digital era has arrived; consumers have become smarter than ever, they are accomplishing multiple tasks on various digital devices including shopping as well. And to reach them marketers need to go digital as well. And to go digital they certainly require digital marketing professionals who can help them do that and know the in and out of this thing called’ Digital’. Instead of considering business schools in India and getting spoilt for choice make the right move and learn what you can make use of. Learn what the industry longs for as at the end of the day, that is something which is going to pay you and not the “bookish information’ that has little importance in current day scenario.